Jan. 24 -- Taylor M. Jenkins, 17, was issued a citation on U.S. Hwy. 62 West for careless driving. Jan. 24 -- Keiron D. Hill, 25, was issued a citation for speeding 20 mph over limit while traveling North Main Street. Jan. 24 -- James S. Duff, 43, was cited on North Main Street for failure to wear seat belt, failure to produce insurance card, and no registration receipt. Jan. 25 -- Tiffanie R. Smith, 24, was arrested on an execution of warrant in Harrison County. Estate of Neva Diana Jones Crump, probate hearing; order entered. Estate of Peggy Joyce Jewell, probate hearing; will admitted to probate, order entered, bond approved. Estate of Bobby E. Jones, probate hearing; order entered. Estate of Michael Ray Marshall, motion hour; order entered. In re: Shannon Renee Napier, probate hearing; order entered. James S. Clyde vs. Briana Beagle, court trial; forcible detainer sustained. Jan. 24 -- At 4:05 a.m. a non-injury accident occurred on U.S. 62 West four miles west of the city limits. Aaron Epperson of Fourth Street in Berry slid off the roadway due to ice and snow. Jan. 29 -- At 7:12 a.m., a non-injury accident happened on KY 392 about 10 miles east of Cynthiana. April Myers of Hardins Ferry Road hit a patch of ice, slid off the roadway and struck two trees. MONDAY: Sausage gravy and biscuit or cereal and yogurt, juice or fruit, choice of milk.. 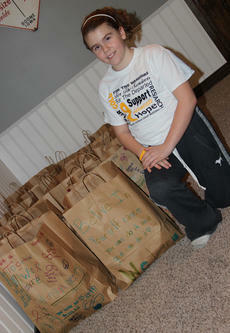 When Lauren McNees hit the big double digit birthday on Jan. 9, her birthday wish was real simple and real unusual. The large Harrison County crowd that attended the game Tuesday night at Henry Clay came away with the same thought. The Thorobreds snatched defeat from the jaws of victory. Harrison County, after trailing very early, led from the latter part of the first quarter until 2:55 was left in the game. At that point, the Blue Devils took the lead 53-52. Brock Jenkins then hit a three pointer to make the score 55-53 with just over two minutes to play. 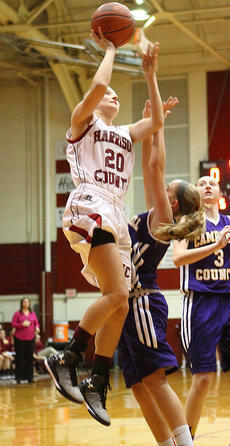 The Harrison County Fillies trailed by as many as 10 points in the second half Monday night. They rallied to cut the lead to one on two occasions but could not gain the lead in a 42-38 loss to Campbell County. Free throws again played a large part in the Fillies loss as they made only four of 11 tries for the game. Senior Whitney Gray, who led all scorers with 12 points, made all four of her free tosses and the rest of the Fillies were zero for seven. Senior Kassidy Cook set two Harrison County High School track records Saturday participating in an indoor meet at Mason County. Cook won three events and finished second in one to lead the Fillies to a fifth place finish. Harrison County took only a small group of athletes so team finishes are a bit misleading. This came to me partially during the trip back from Mason County Friday night. I am writing on Monday morning when there is no school in Harrison County due to icy roads. After trying to walk to the street, I totally agree on school being called today. I do question playing in Mason County Friday night. The weather people were calling for snow and increasingly more snow as the afternoon wore on and the weather pattern became clearer. Feb. 1 - Kick-off of Heart Month, Paint the Town Red, Sunday, Feb. 1; National Wear Red Day, Go Red Harrison County Schools, Friday, Feb. 6; Wear Red to Church Day, Sunday, Feb. 8, send pictures to cmuntz@hmhosp.org; Harrison County Go Red Reception, Monday, Feb. 23 from 5-6:30 p.m., Harrison County Extension Office, 668 New Lair Rd. Guest speaker will be Matthew Shotwell, M.D.